As we approach the 400th anniversary of the completion of Derry’s Walls, visit one of the finest examples of Walled City’s this year. Built from 1613 – 1619 by the Honourable The Irish Society as defences for early seventeenth century settlers from England and Scotland. Approximately 1 mile long, the walls form a walkway around the inner city and provide a beautiful promenade to view the layout of the original town. The four original gates to the Walled City are Bishop’s Gate, Ferryquay Gate, Butcher Gate and Shipquay Gate. Three further gates were added – Magazine Gate, Castle Gate and New Gate. The Walls are the most complete in Ireland and one of the finest examples in Europe of Walled Cities. The city claims Europe’s largest collection of cannon whose origins are known precisely. Many of them thundered in anger over the two seventeenth century sieges. In 2005 the surviving 24 cannon were restored, and under expert supervision and often by hand, craftsmen, cleared the barrels of centuries of rubbish, stripped off layers of paint and corrosion and bathed, sponged and waxed the cannon back to their former glory. The cannon are displayed throughout the City Walls with the impressive Roaring Meg located on the double bastion. 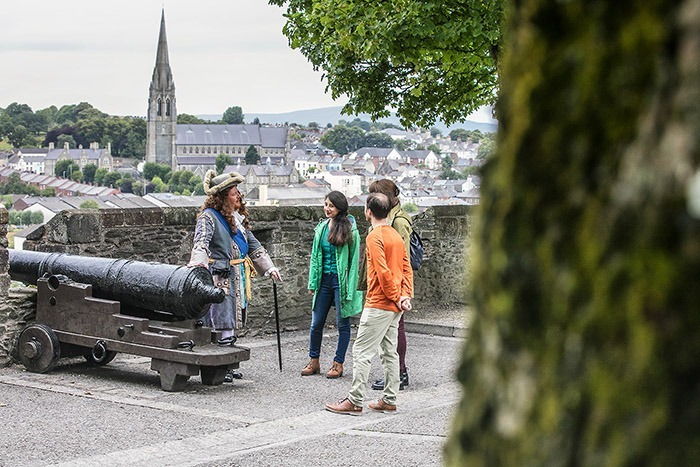 This celebration of the 400th anniversary of the completion of the Walls programme will provide a great opportunity for both visitors and locals alike to experience the Walled city at its very best. For more information visit walledcity400.com.